We all know the importance of professional development, right? It’s probably why you’re reading this blog post. You might even be a member of CharityComms. When you work in communications, marketing or digital, it’s even more important to keep up to date with the pace of change. But what do you do if your charity has little to no budget for training or upskilling? Here are six ways you can take charge of your own professional development. If you, or your organisation, has a membership to CharityComms, Institute of Fundraising, CIPR etc, are you making the most of it? Have a look at what’s included in your membership. You may be able to attend seminars, events, special interest groups, etc – at no extra cost. 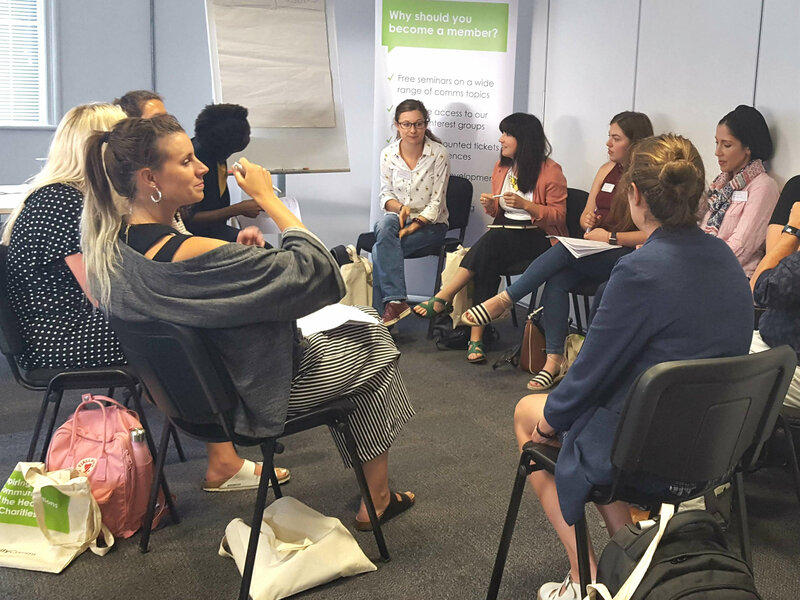 Many membership bodies, such as CharityComms, also offer a mentoring programme for members and having a mentor could be just what you need to help you take that next step in your career. Recently, I joined the creative team at Open to do work experience for a week. I write a lot for the sector, but I haven’t written ‘as a charity’ for a while. I could have contacted a charity and volunteered, but I wanted to receive critical feedback, which I wasn’t sure a charity would give me so freely. So, I contacted Open and asked if I could do work experience with Alfie, one of the copywriters, for a week and the team agreed. During the week I got to flex my copywriting muscles as well as learn how an agency works. And best of all? I got that feedback I was looking for. A secondment is when you’re assigned to a different part of your organisation or when you work at another organisation, either in the same role or a different one. Nikki Bell, fundraising relationship manager at British Heart Foundation, has recently completed a secondment within the charity and spent the last eight months working on the charity’s brand refresh as a fundraising brand campaign project manager. The secondment gave Nikki project management experience, the opportunity to work alongside senior stakeholders and influence decisions, gain cross-fundraising campaigns and marketing insight, and allowed her to build relationships across the charity. Is there something very specific that you’d like to learn? Such as how to optimise Facebook adverts? Perhaps you’re a whizz at creating GIFS? Why not take part in a skills swap with someone at another charity? If you’re part of the Third Sector PR & Comms Network Facebook Group, then you can post about the skills you’re looking to gain and what you can offer in return. As a communications professional, it’s essential to really understand your organisation and what it’s trying to achieve. One of the best ways to do this is by shadowing a colleague. Hayley Epps, interim communications manager at Shooting Star Chase shadowed a care shift at one of its hospices when she joined the charity. Having not worked in the hospice sector before, Hayley had little knowledge and understanding of what hospices do so the care shift was a great way of seeing the broad range of care and support available to families who have a life-limited child. Aside from events that may be included in any memberships that you hold, there are lots of other sector events where you can both learn and network. Charity Meetup, run by Dawn Newton, is a regular series of events, which each have a theme. The next one is on Diversity and Inclusion and will be held at Google. Want to learn more about fundraising, in your comms role? The Institute of Fundraising has a whole host of special interest groups and regional groups that hold events, and you don’t need to be a member to attend. Don’t let a lack of budget hold you back from developing professionally. There are so many ways to take charge of your own career development, without having to spend a penny. Kirsty is a copywriter, accredited trainer and consultant working in the charity sector. Previously she was the content and community manager at JustGiving. She has a regular column in Third Sector where she writes about all things digital.